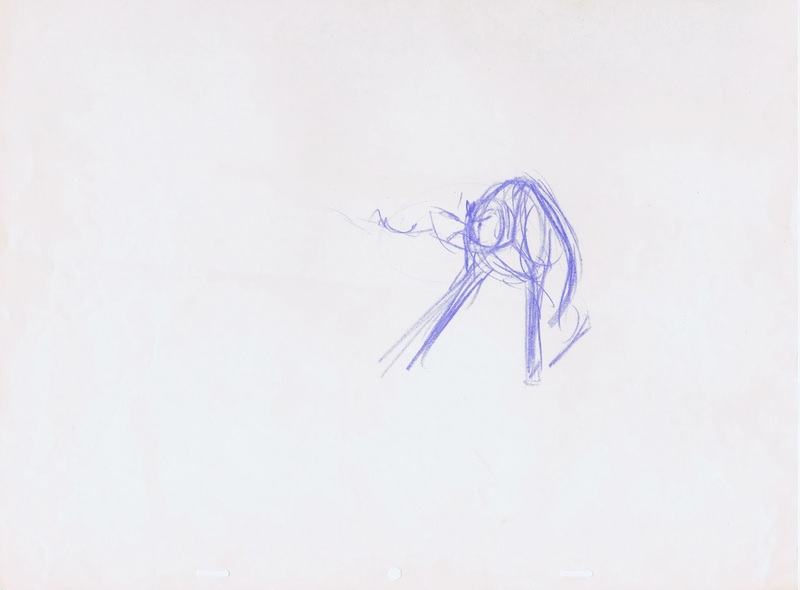 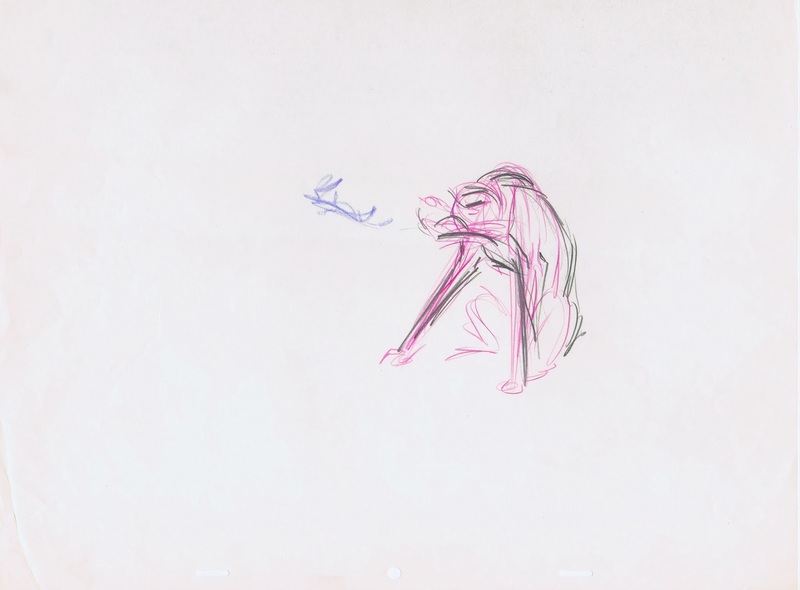 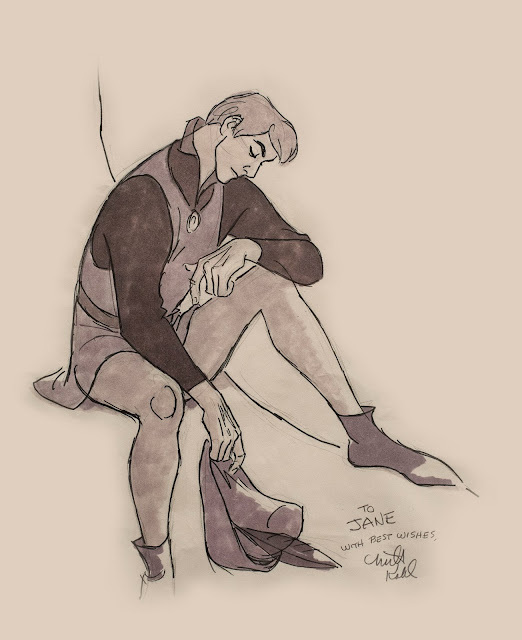 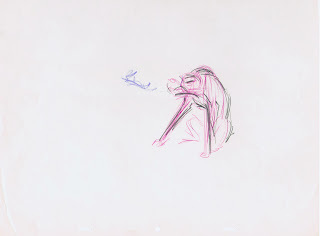 This is a sketch Milt Kahl did for a fan named Jane, a while after he had left Disney. 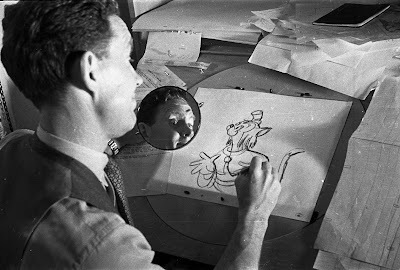 I remember Milt talking about a lady he was corresponding with, who thought that the sun rises and sets with his animation. 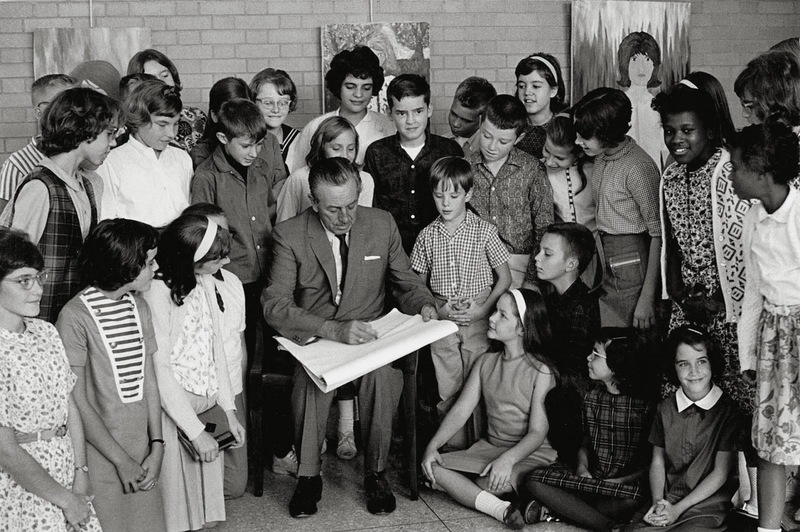 Obviously flattery goes a long way, not only did Jane get a Kahl original, but a drawing of Prince Phillip, the character he had abhorred animating many years earlier. 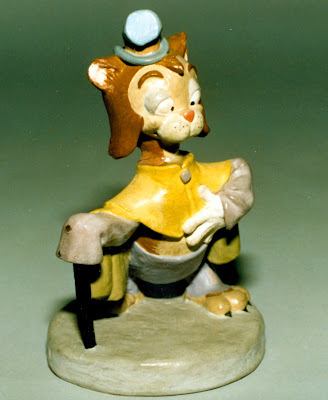 This piece was offered at auction years ago, and I was lucky enough to pick it up. 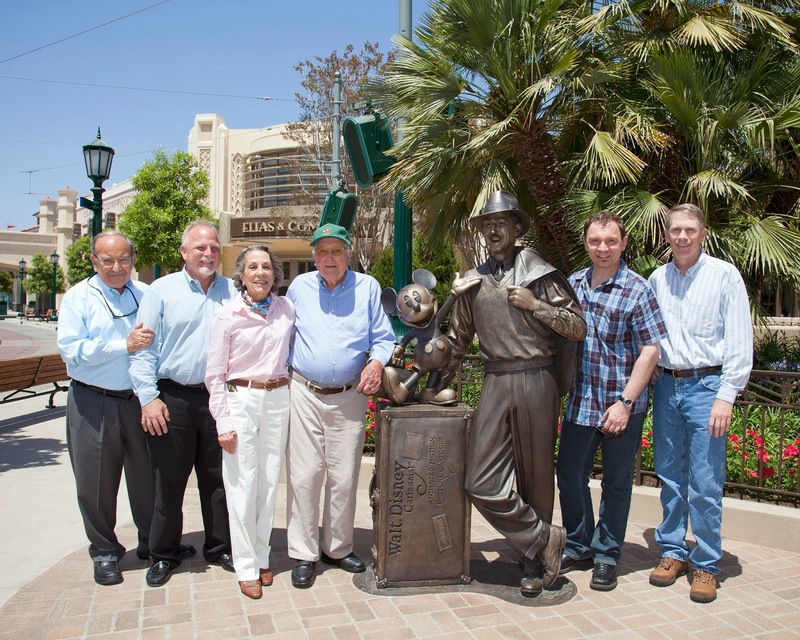 Even in retirement you can see that Milt still had the touch. The human body simplified to perfection. 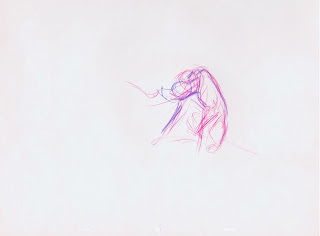 One continuous line defines the Prince's back, from his neck all the way down to the knee. 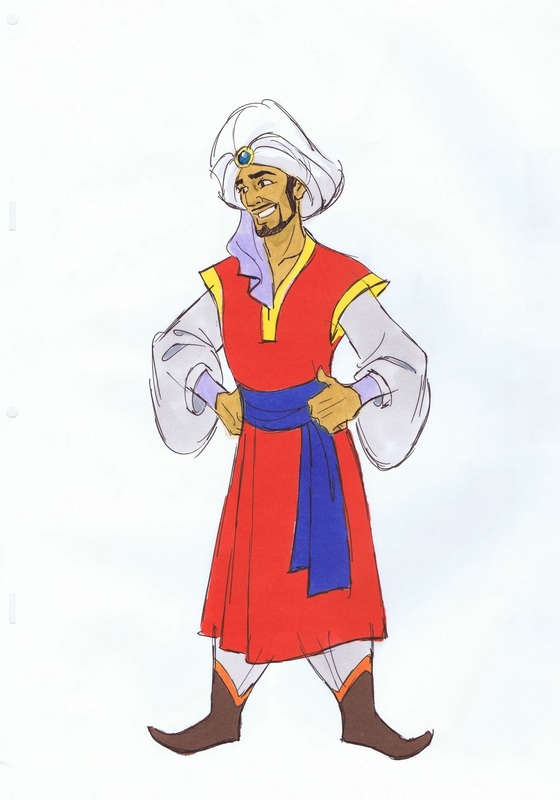 The other side of his torso is a contrasting straight line. 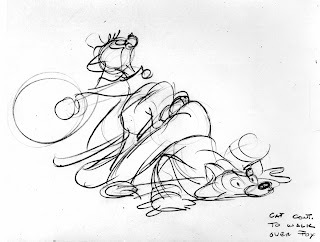 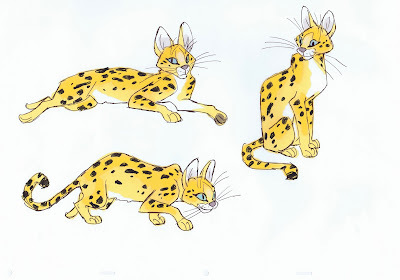 There is something to be learned from every Kahl drawing, no matter at what stage in his career it was made. Ollie Johnston animated this scene with Pongo as he growls and backs away from the approaching Cruella De Vil. 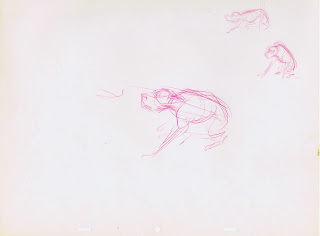 The following rough drawings explore a pattern of how to get into that final pose, which, as you can see, has been given a lot of thought. 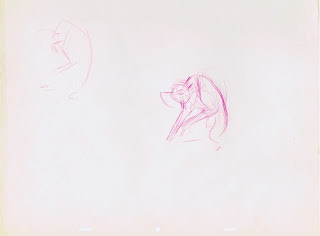 There are several versions of it, drawn with different color pencils. 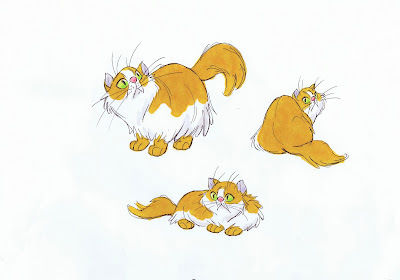 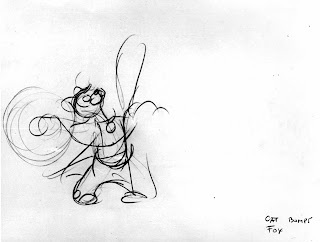 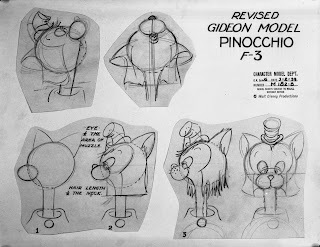 I believe that Frank Thomas did these to help out his fellow animator Ollie Johnston. 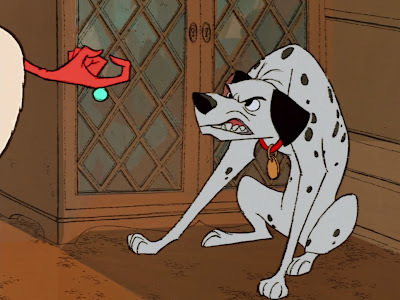 One step closer and I'll bite off your finger! 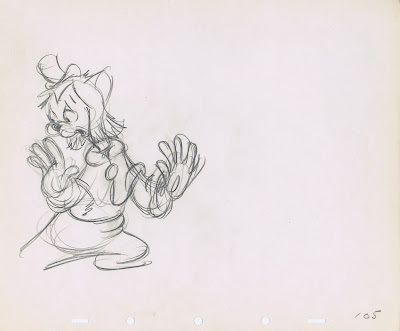 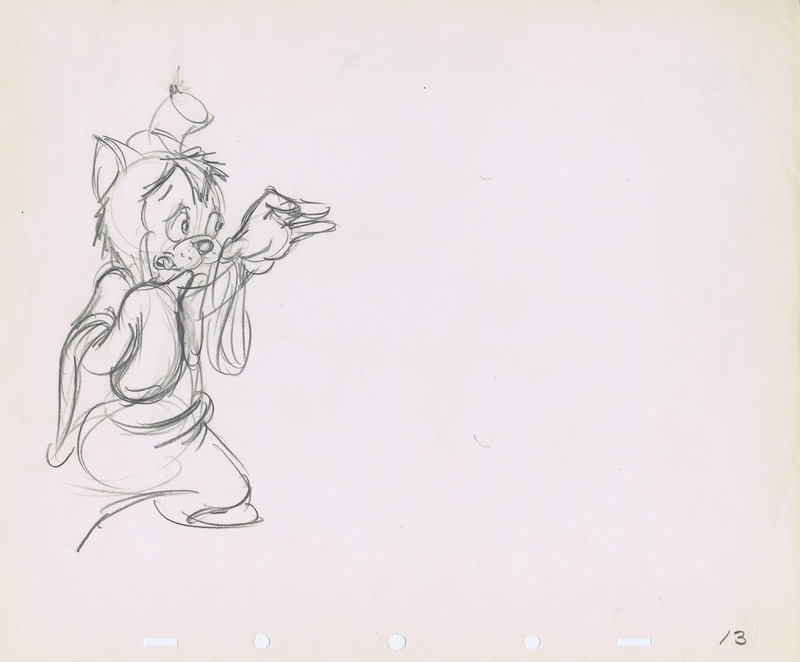 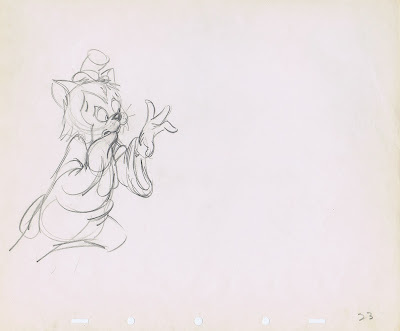 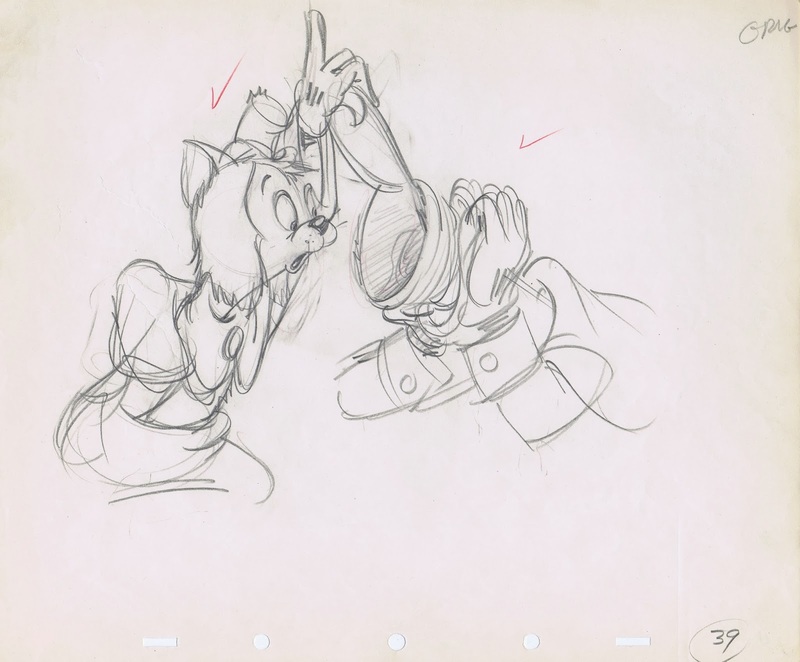 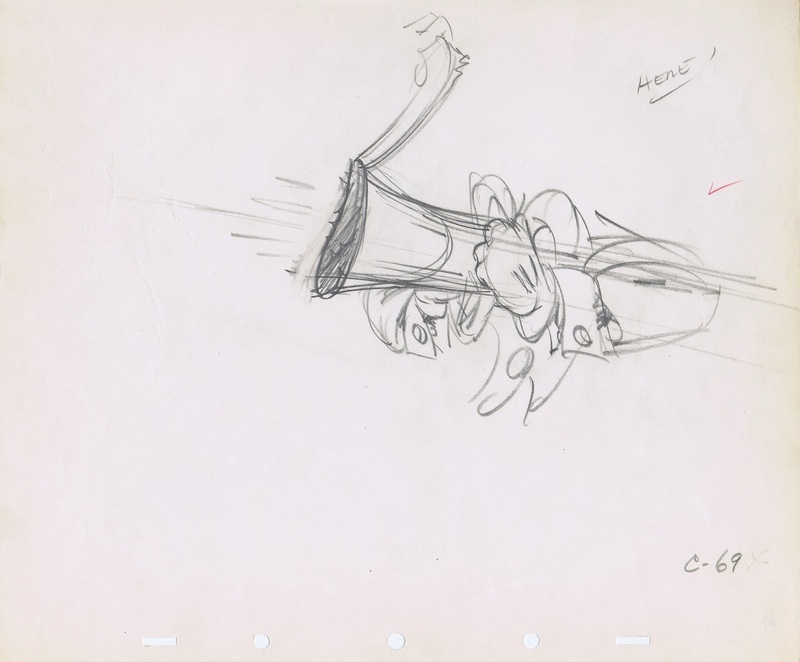 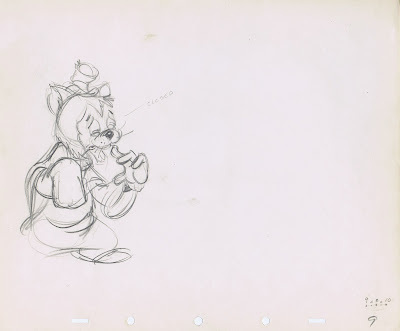 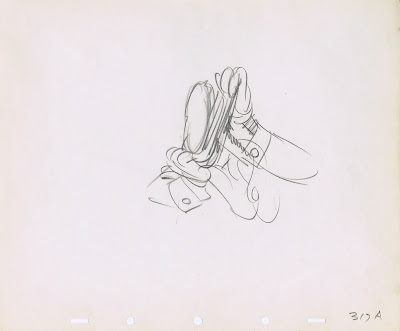 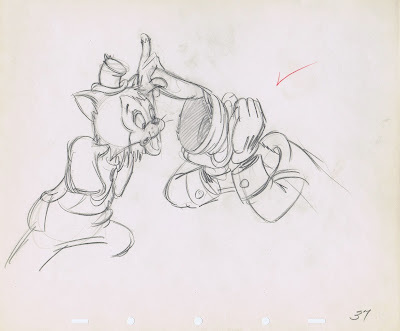 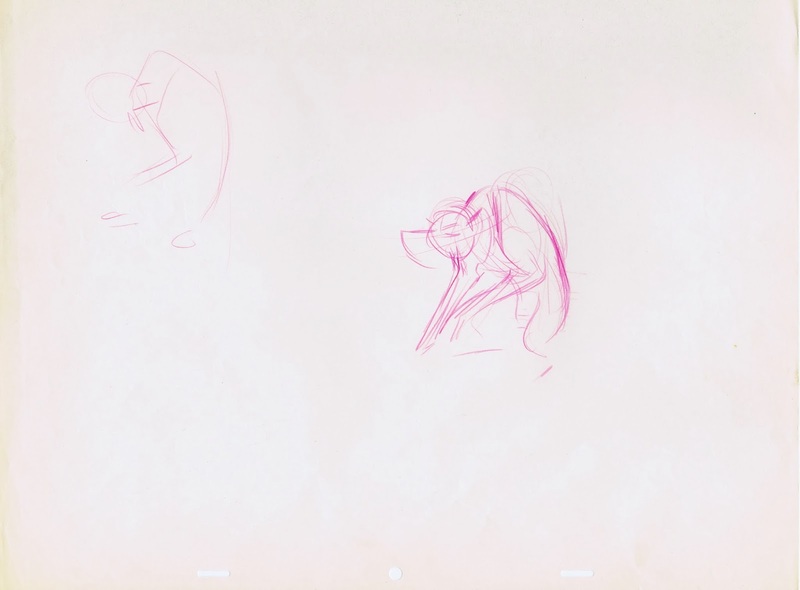 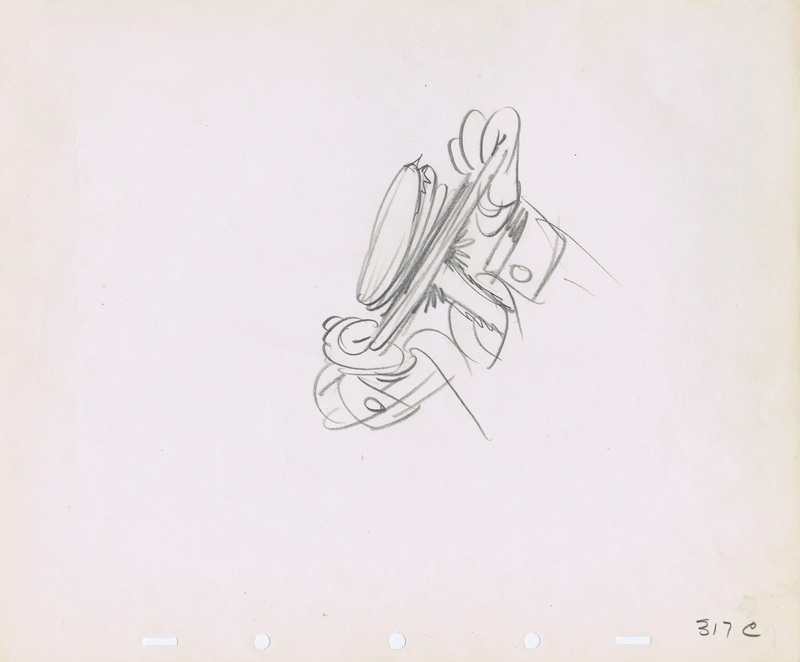 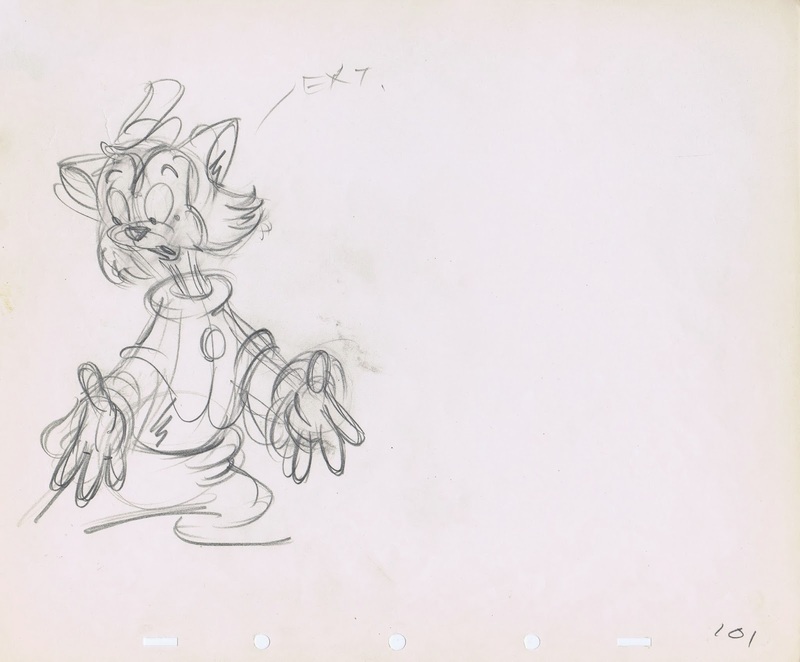 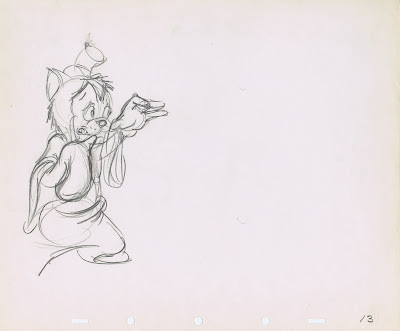 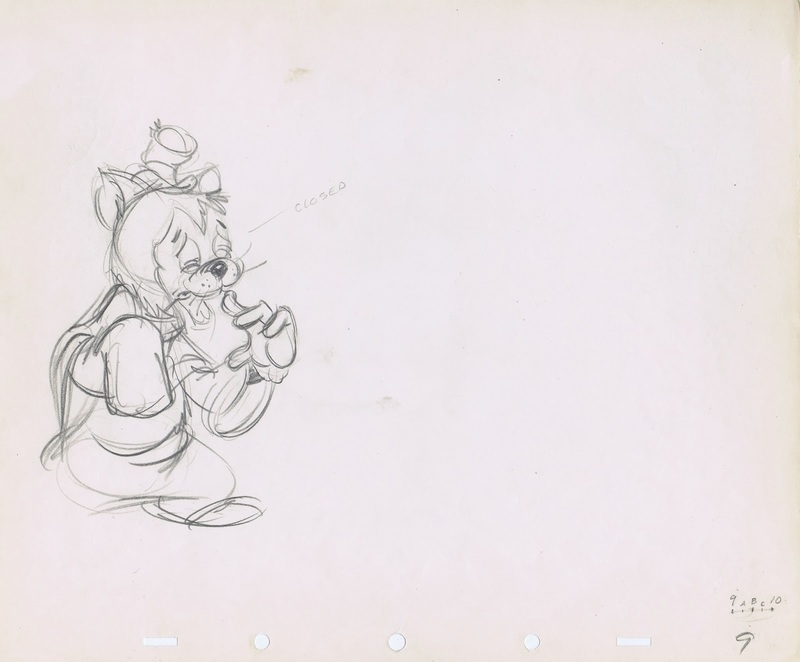 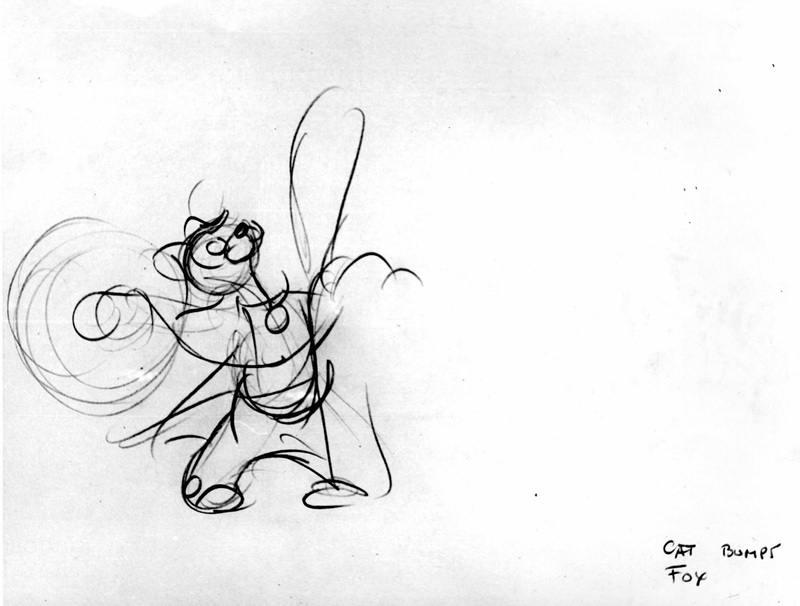 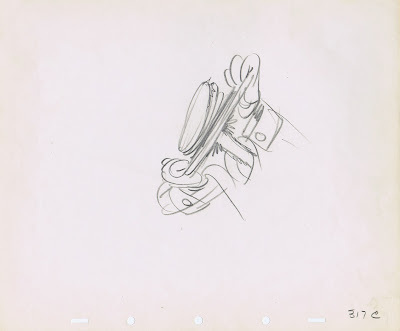 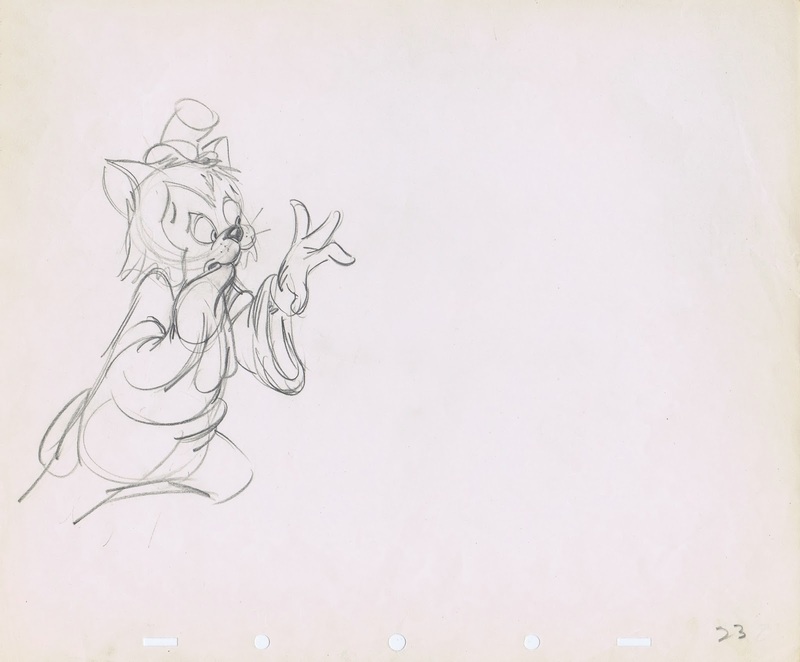 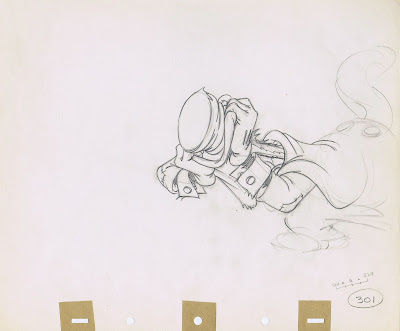 Milt Kahl offered this expression, which shows threat and disgust at the same time. 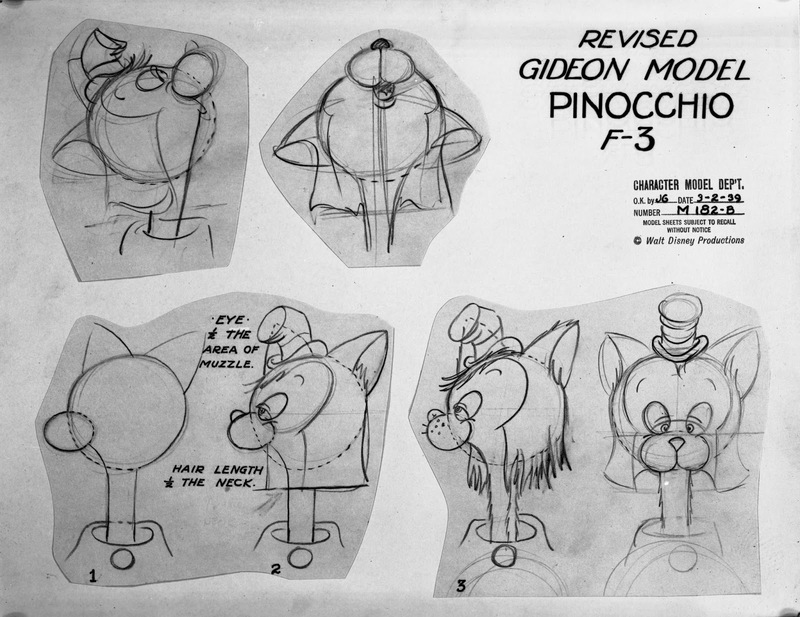 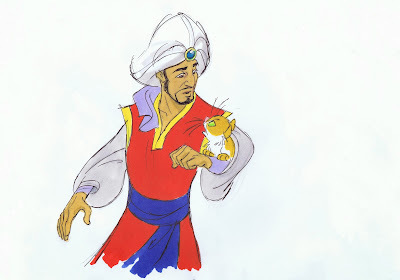 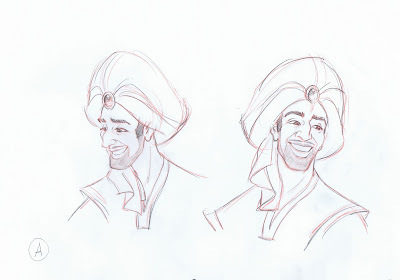 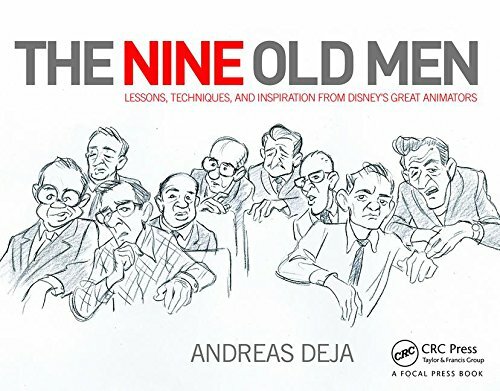 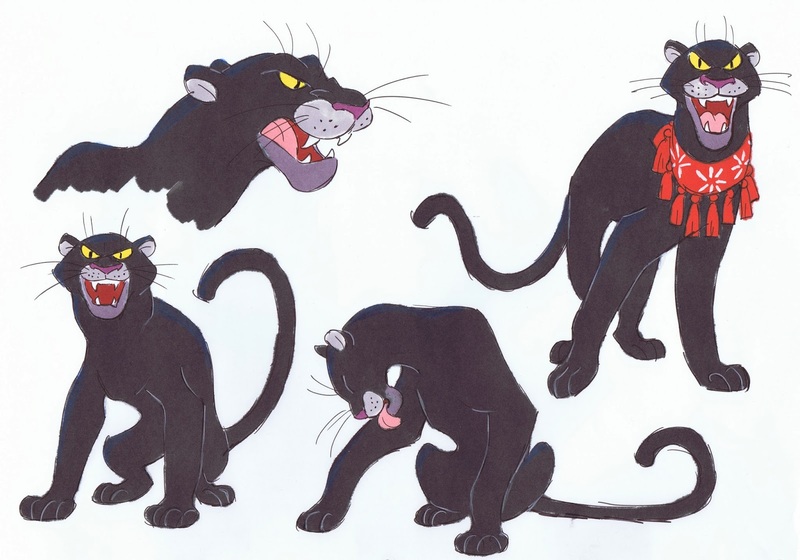 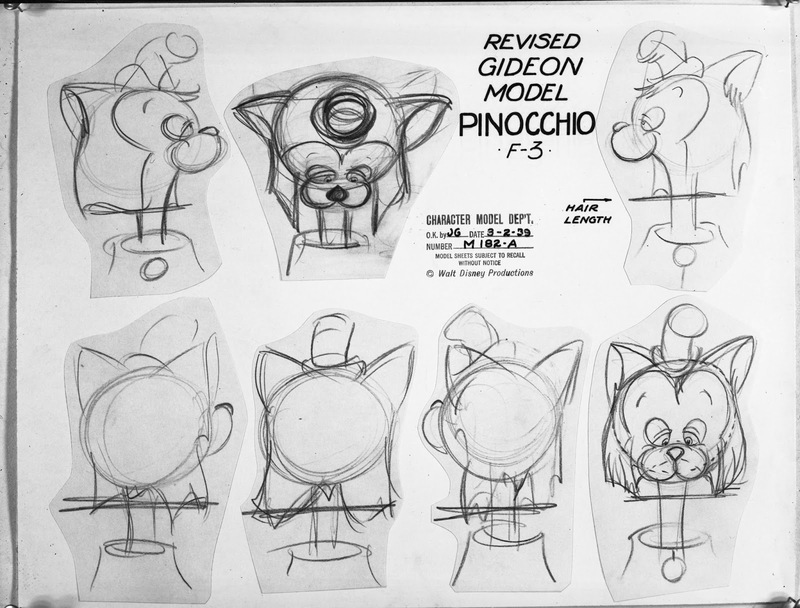 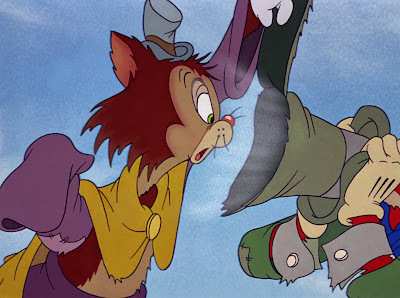 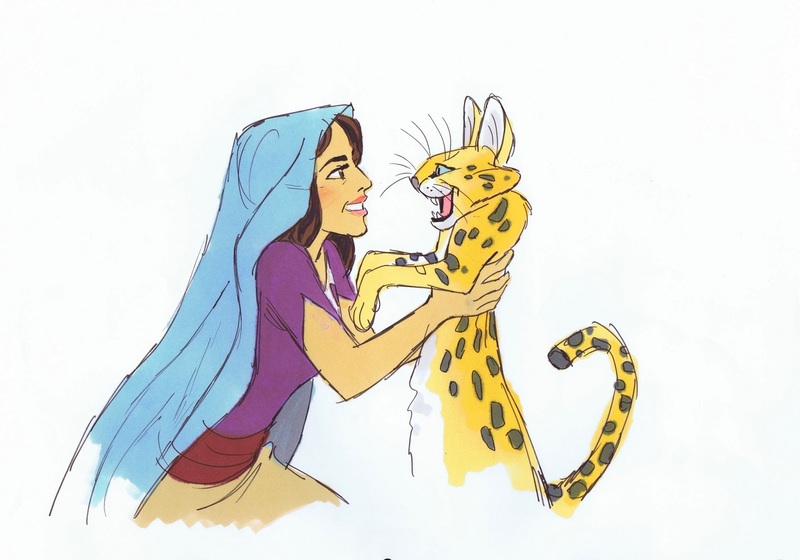 The drawing is graphically sound and right in line with the shape language of the character's design and the film's style. 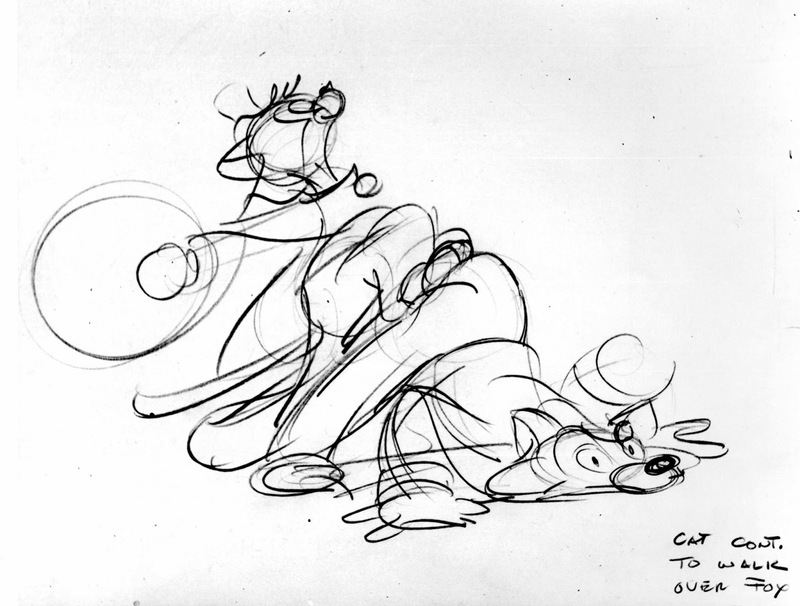 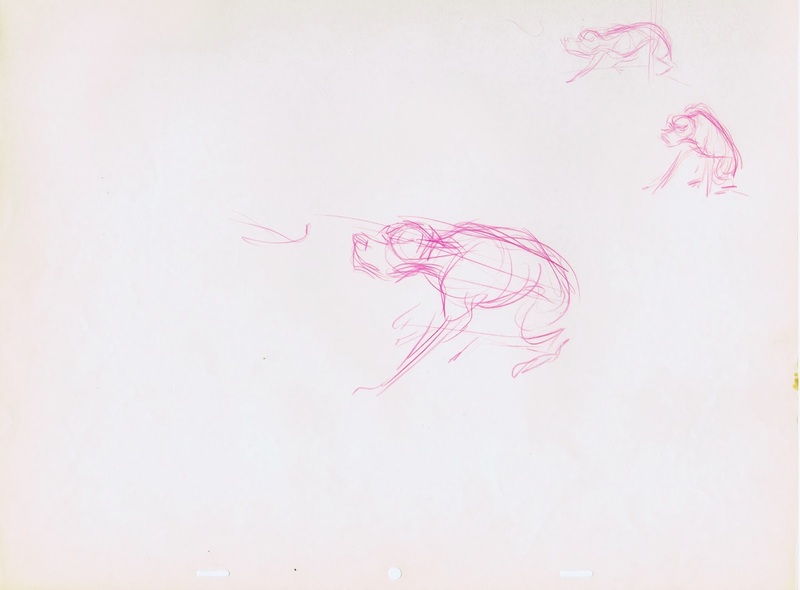 Bill Peet's storyboard of the sequence shows the way he staged the Pongo/Cruella encounter (top row). Most of you have heard or read by now of the sudden passing of Walt Disney's daughter Diane. 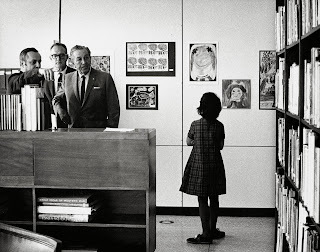 My heart goes out to her husband Ron, her children, but also to the wonderful staff at the Walt Disney Family Museum. 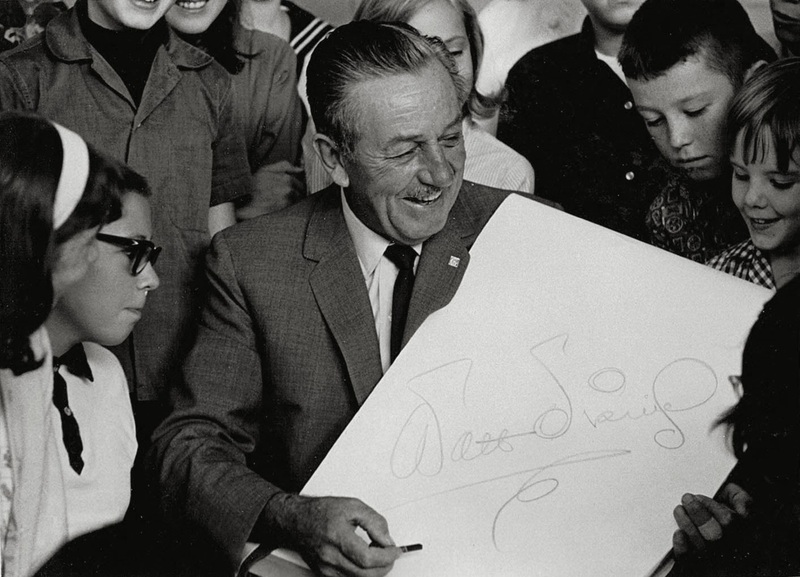 "My family is very proud of our heritage, but we don't take credit for it." 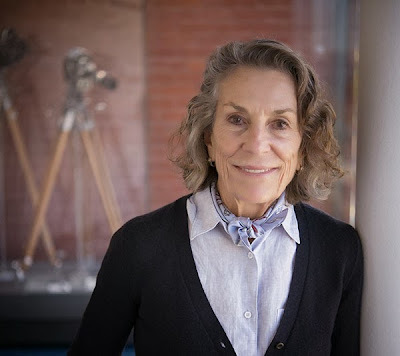 At first I was surprised, but the more I thought about it, the more I respected Diane's point of view. 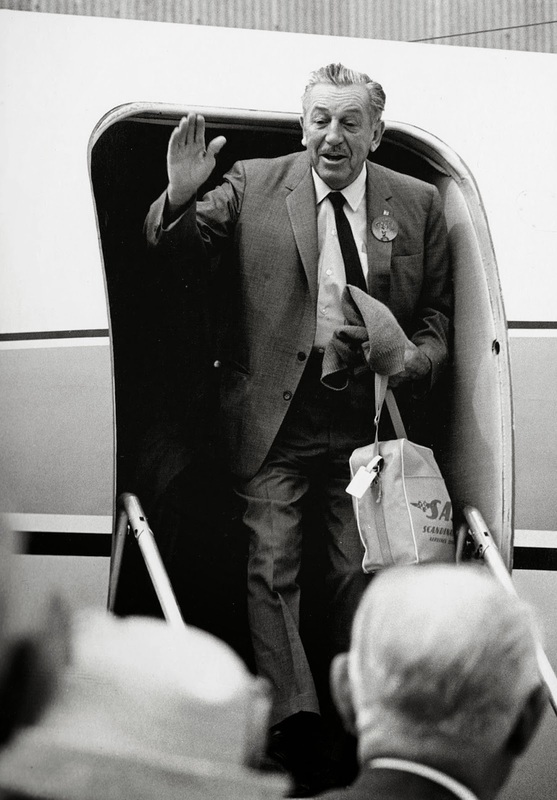 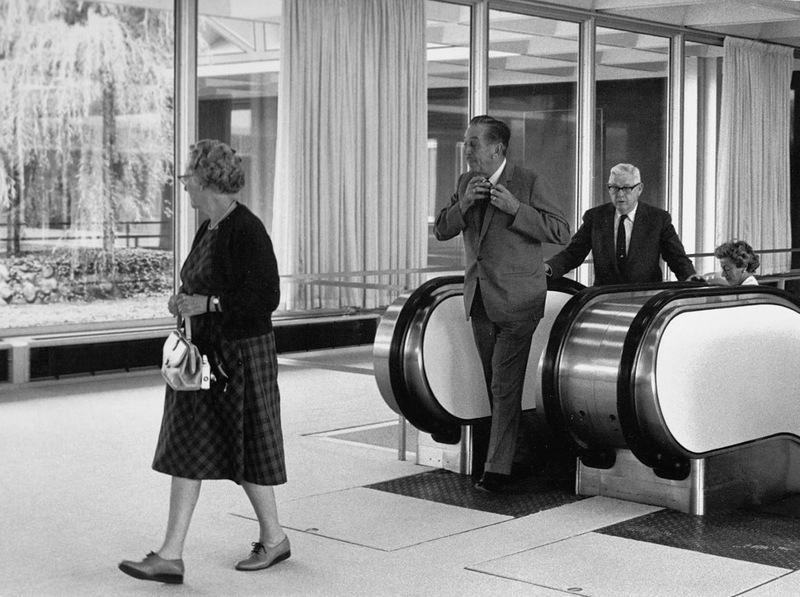 When Alice announced that we were all going to have lunch at the Tam O'Shanter restaurant nearby, Diane said: "Gosh…Dad and I used to go there all the time". 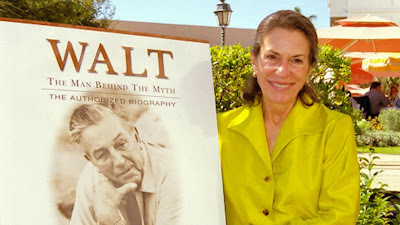 That phrase stunned me for a moment, after all only Diane (and her younger sister Sharon) could refer to Walt Disney as dad. Over the years I had the chance to see Diane at various functions, my most recent get together was just last September in a meeting with Museum staff and members of her family. 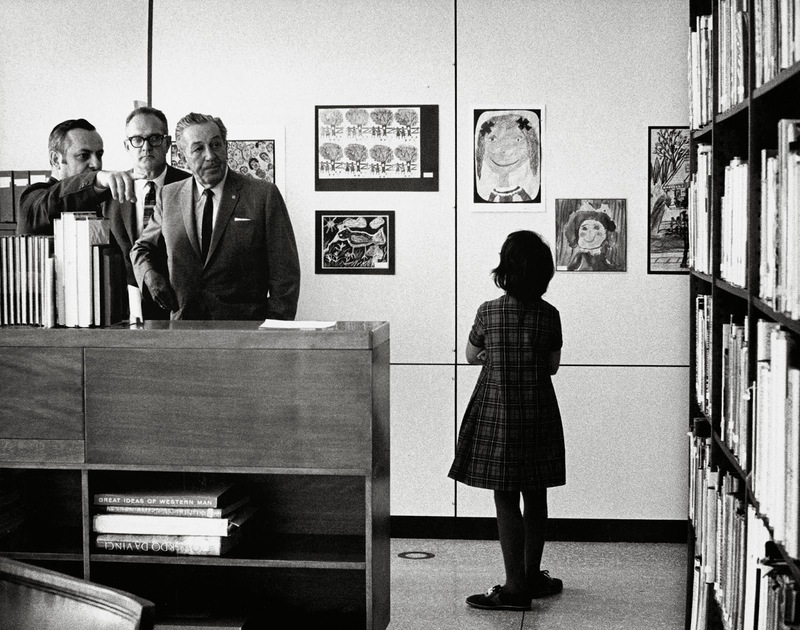 Diane was full of energy, full of ideas for future exhibitions, panels and events at the Museum. Due to her strong will and convictions, all of us in LA can enjoy performances at the amazing Walt Disney Concert Hall, which finished construction in 2003, but only because of Diane's persistence and generous support. 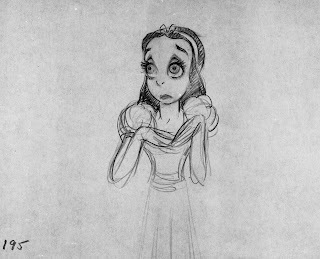 Alice Davis said that Diane was like her father in many ways. 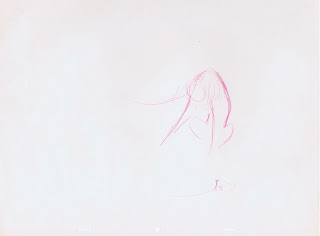 When she wanted to get something done, she did it with passion, the best way possible, no matter how many obstacles might come her way. 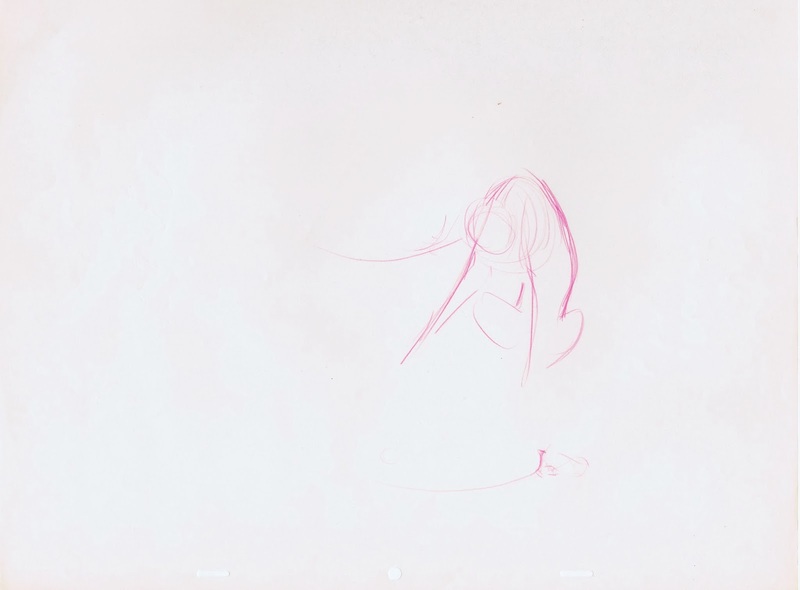 To say that she will be missed is an understatement. 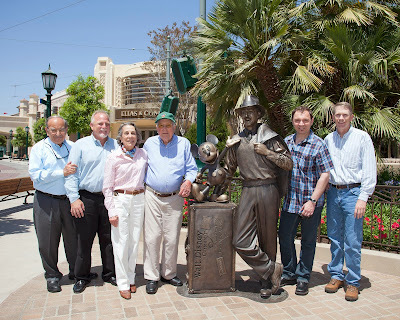 Marty Sclar, Imagineer Ray Spencer, Diane, imagineer/animator Blaine Gibson, Mickey, Walt, me and sculptor Rick Terry. 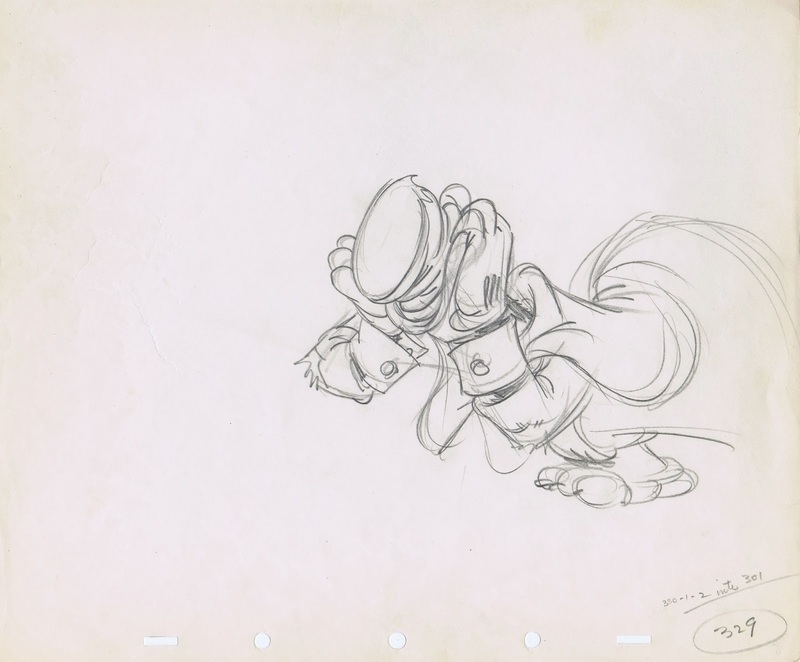 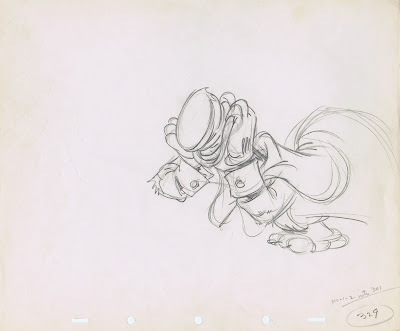 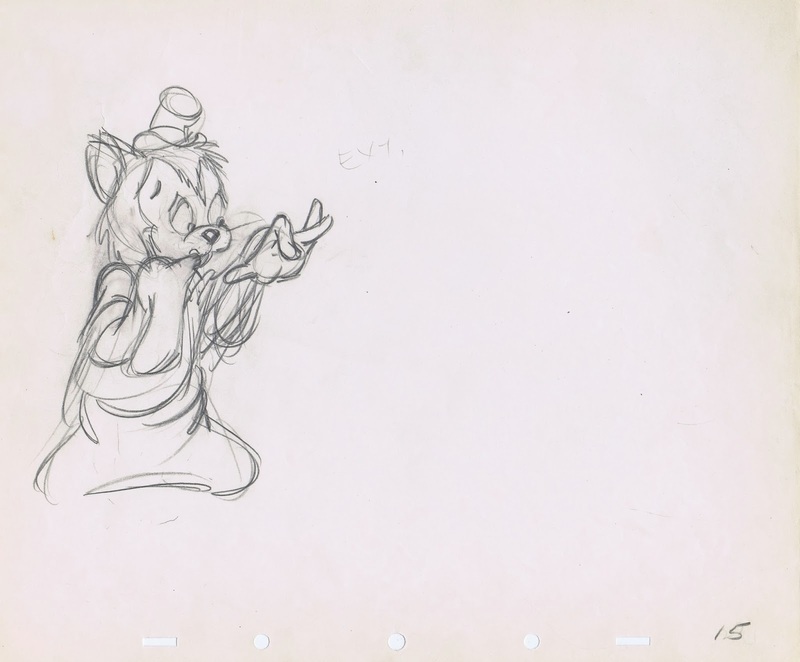 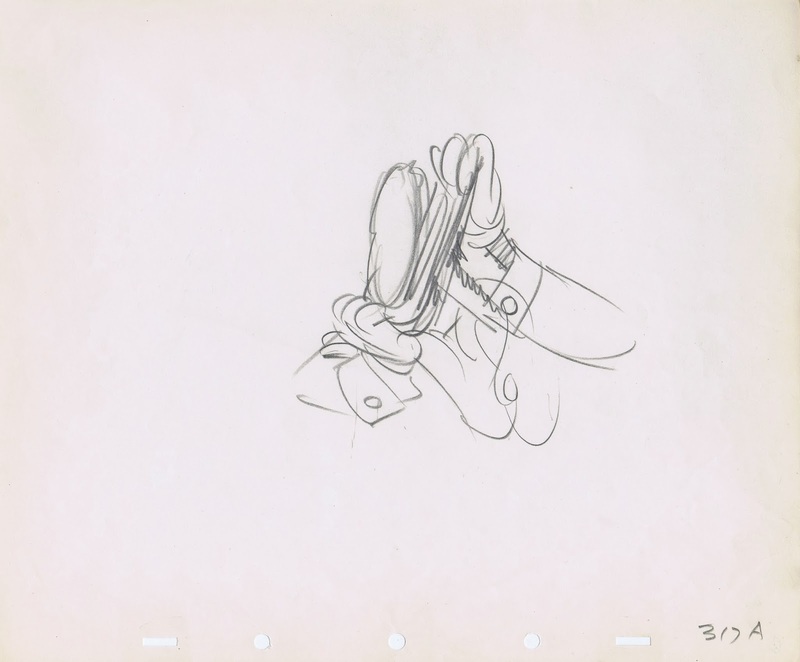 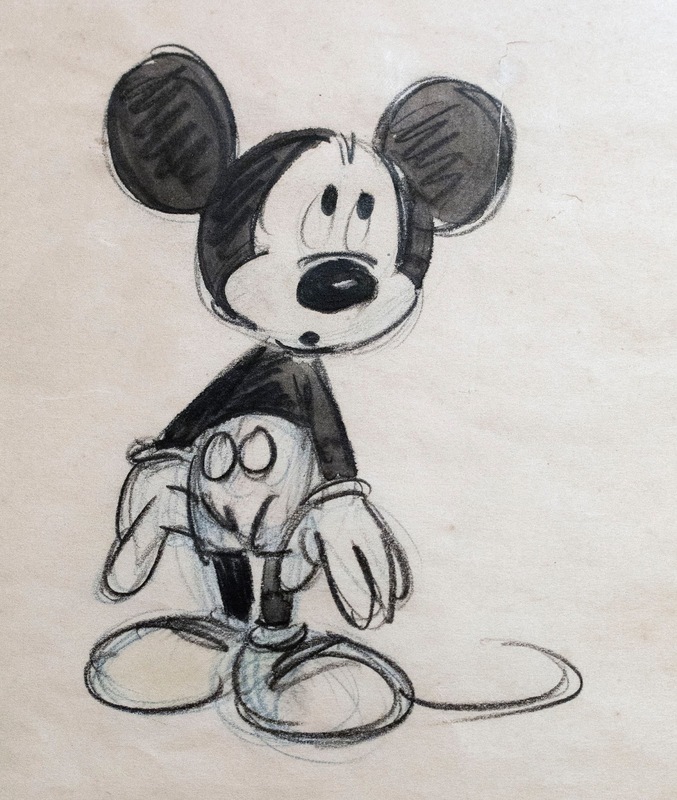 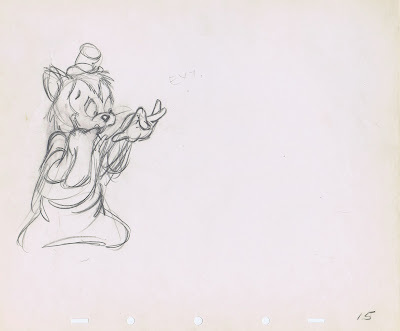 Mickey Mouse sketch by Fred Moore, early 1940s. 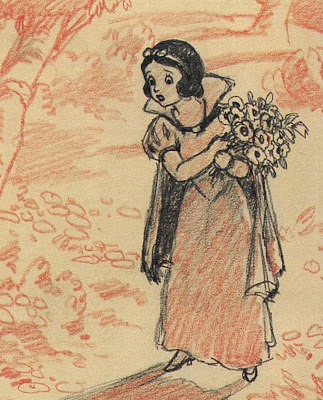 …Snow White might have looked like this. In his beautiful sketch the princess looks very young, and her appearance matches the design of the dwarfs very well. 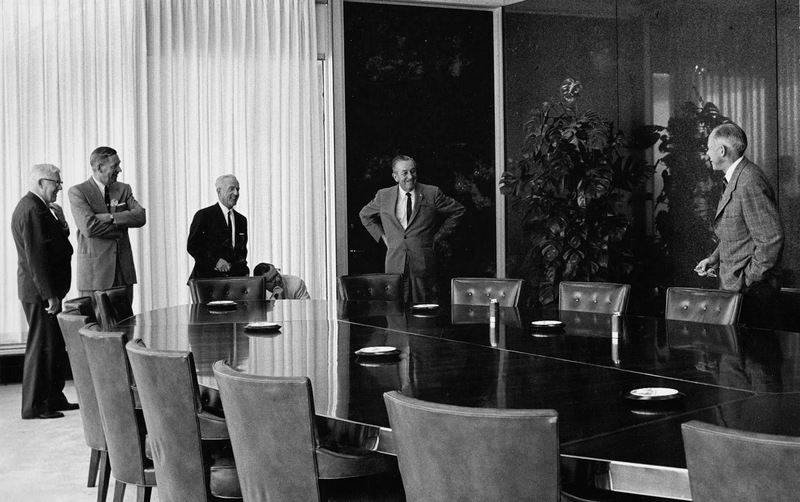 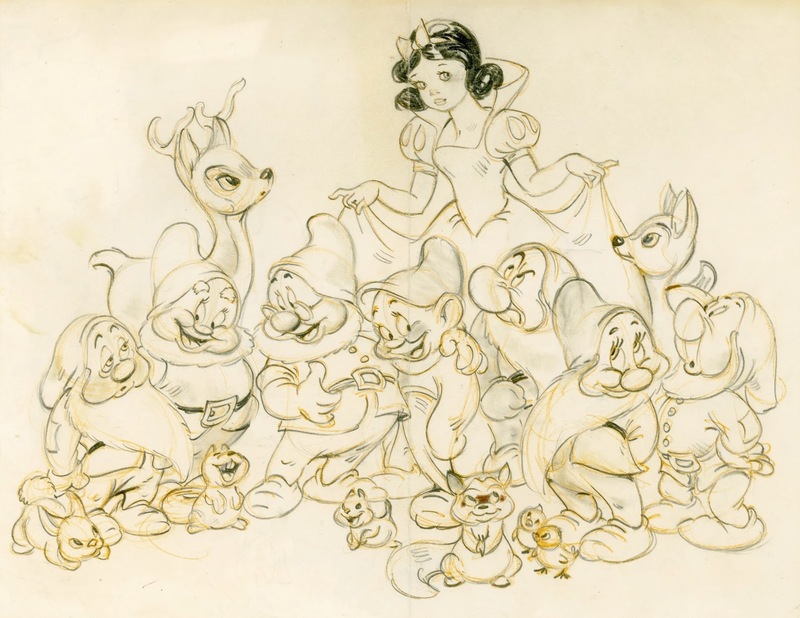 But Walt Disney felt that in order for her to feel real to an audience Snow White had to be drawn with more realism. A cartoony looking girl couldn't portray the dramatic as well as the romantic scenes the way he envisioned it. Live action reference was filmed, and thanks to animator Grim Natwick and assistant Marc Davis Snow White turned out to be as believable as any live actress on film. 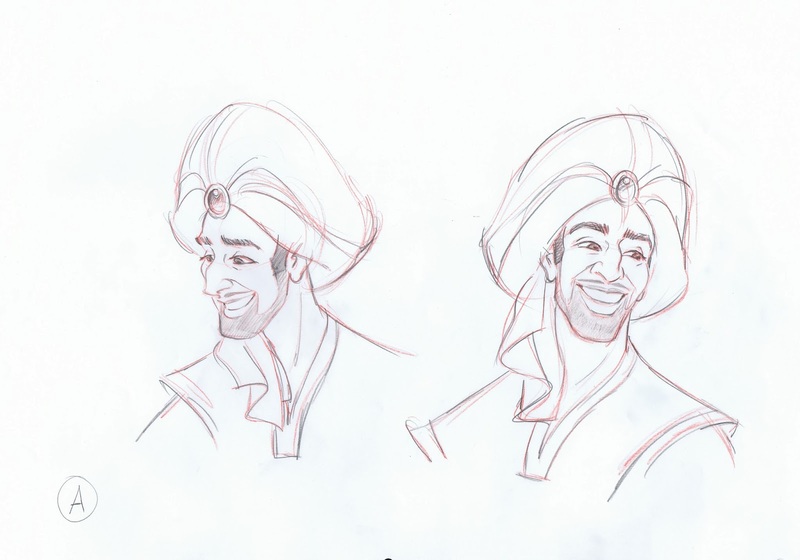 Here are just a few versions that preceded the final choice. 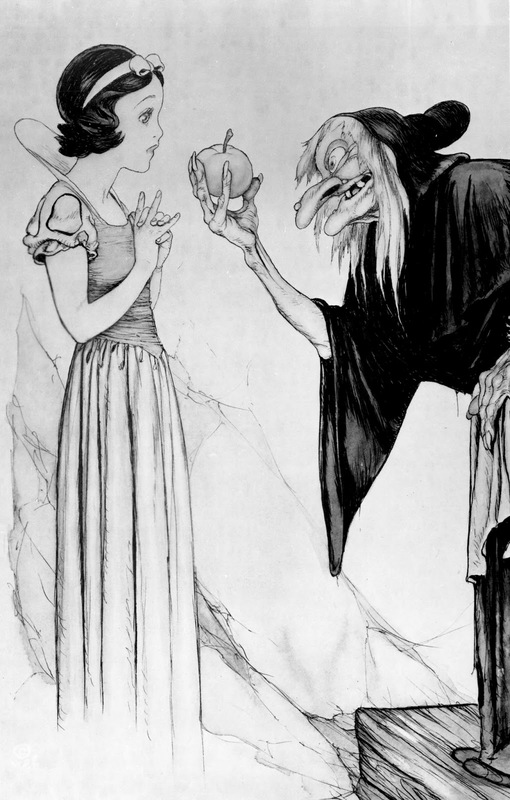 Unknown to me, but what a great drawing. 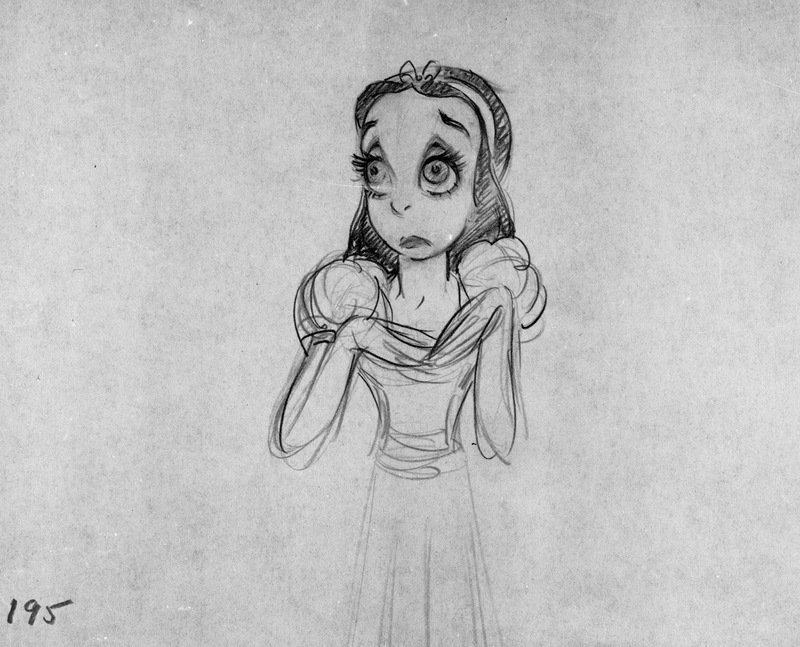 Young Marge Champion acted out scenes for the animators. 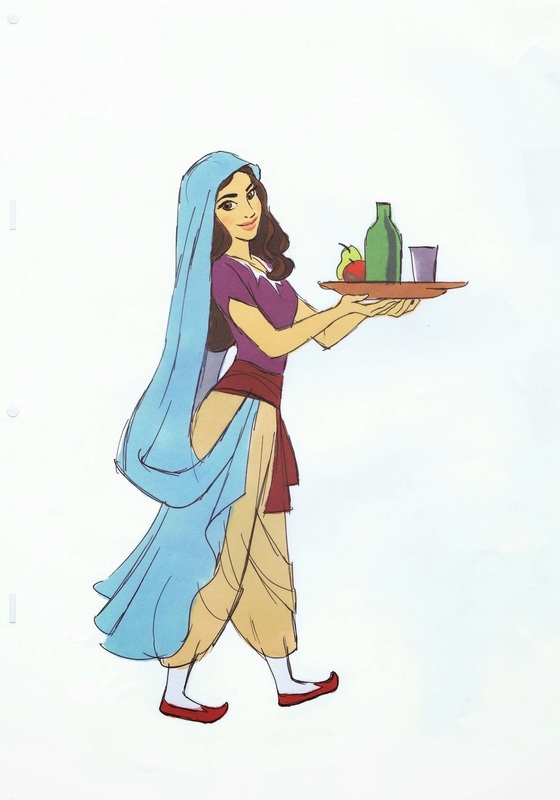 Black lines on her costume helped the artists to translate the photo stats into drawings. They couldn't have picked a better actress to perform this role. 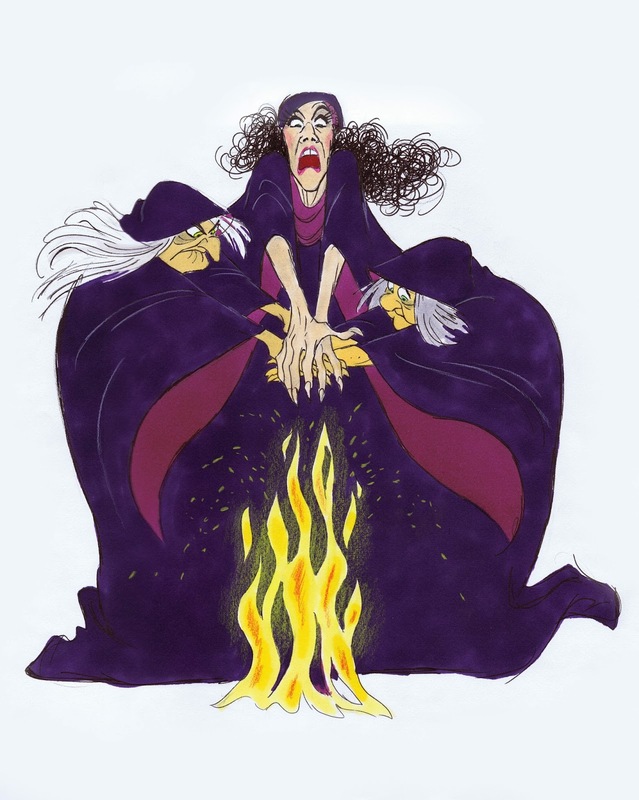 Marge brought so much life to the character with her natural and confident acting. 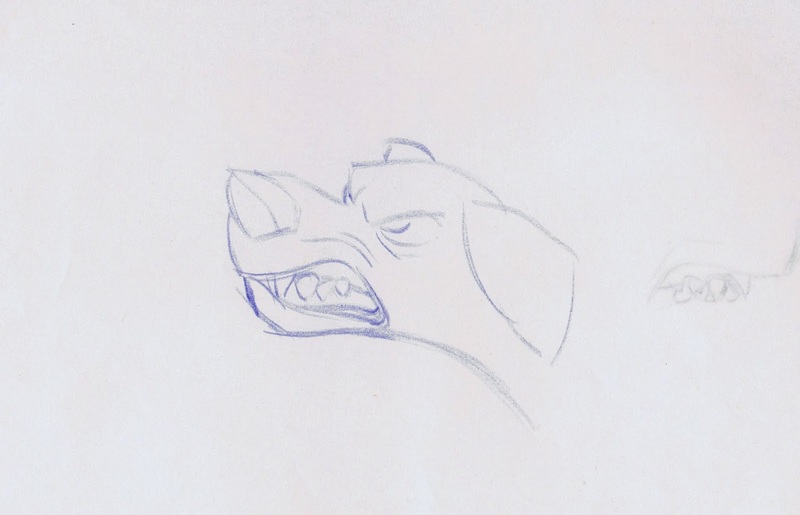 This is one of those things, when a friend asks you to do some character design work. The funding for an animate feature would just be around the corner, blah, blah , blah. 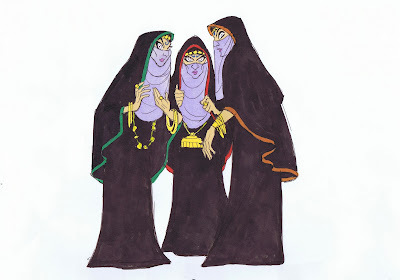 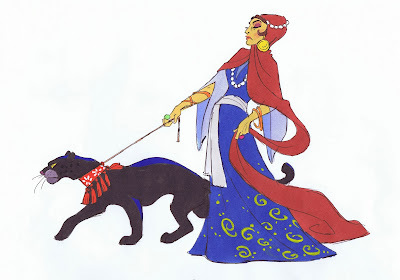 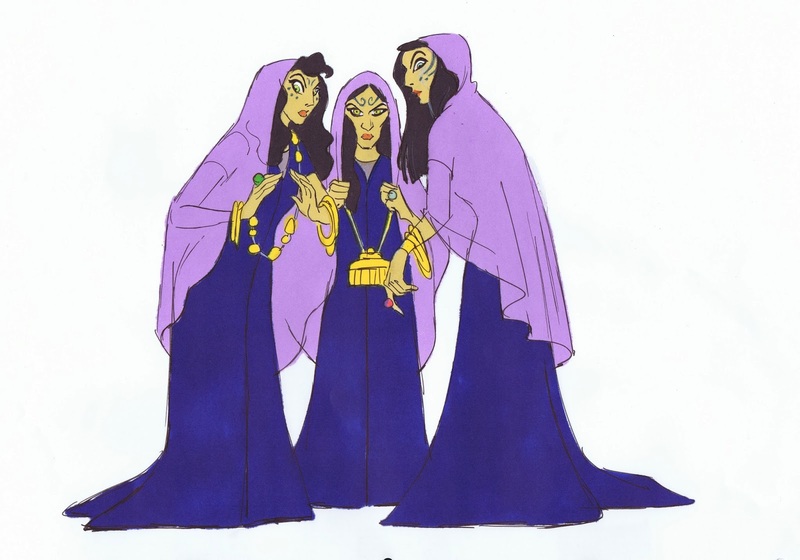 I actually thought the script had potential, so I came up with character designs for this new Arabian Nights Fairy Tale.There were Witches, a prince, a princess and a variety of animals. 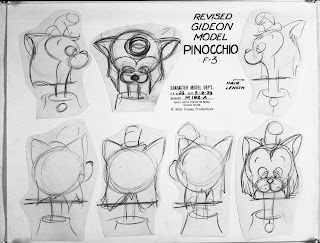 I did enjoyed working on the character concepts until I was told that funding for the originally highly budgeted film had been pulled. Still, I enjoyed creating these character concepts, and I still believe this could be a great hand drawn animated feature.